While brainstorming for a fun ornament to make this year, I thought back to what my grandparents and great grandparents would have done during tough times, like many people are facing these days. I decided to only use things that I already had and pulled out my box of miscellaneous craft supplies. 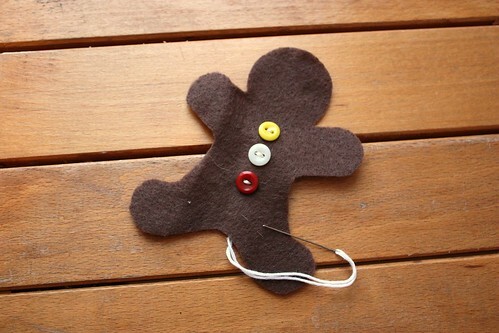 Within the slew of things I found brown felt, embroidery floss, ribbon and buttons. What could I make with this? Print out the template to your desired size and cut it out. 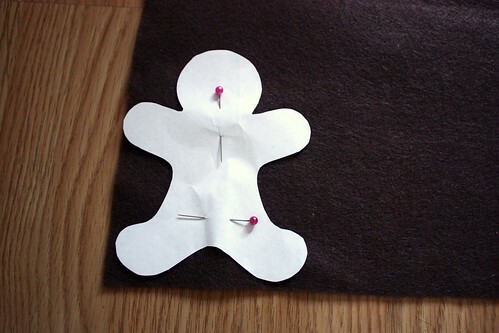 Pin the template to the brown felt, cutting two pieces for every gingerbread man you would like to make. For the buttons, I went to my Great Grandmother’s trusty Button Tin, full of buttons that have been collected for the past four generations. 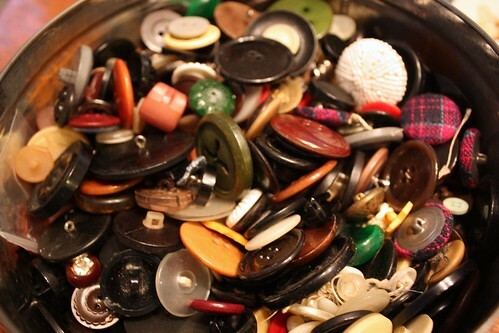 Back then, my Great Grandmother would cut the buttons off of any garment before it would make it to the trash bin (or more likely, the rag bin to be reused again for cleaning). I still keep all the buttons from things before I through them out and have started a little bag of buttons at my own apartment. You never know when you need buttons to repair a shirt, or for a project like this! 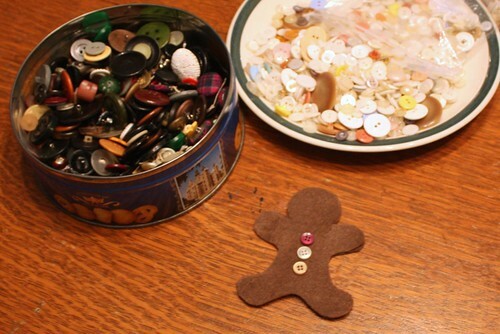 I looked for buttons that were proportionate to the ornament, similar in size, but varied in colour. 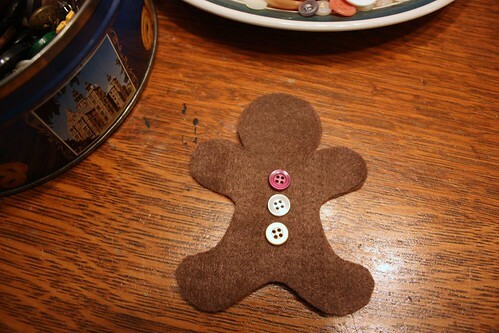 Using the embroidery thread, sew the buttons in place. Create the mouth with 2 slanted stitches with the embroidery thread. 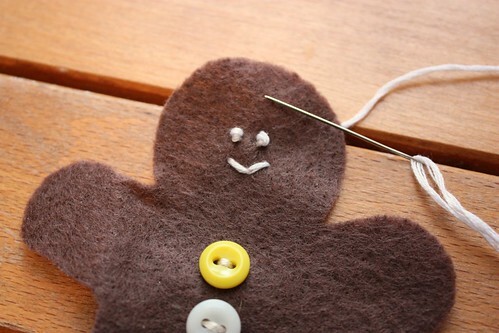 The eyes can be made with a simple French knot using the embroidery thread. 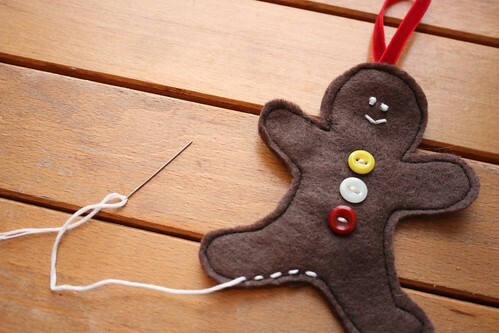 To make a French Knot, bring the floss out at the spot where you would like the eye. Hold the embroidery thread down with you thumb and encircle the needle two times. Still holding the embroidery thread, pull up and gently allow a knot to form. Push the needle back in the felt near the original entry point, being carefully not to pull the entire knot through to the backside. 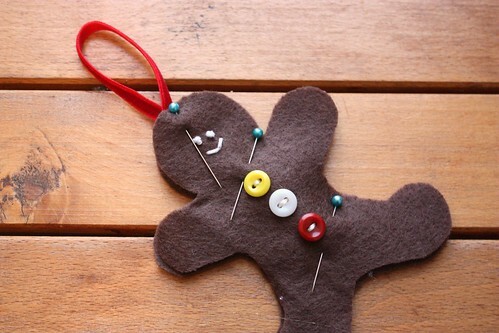 Pin a 6″ piece of the ribbon in a loop at the top of the head. 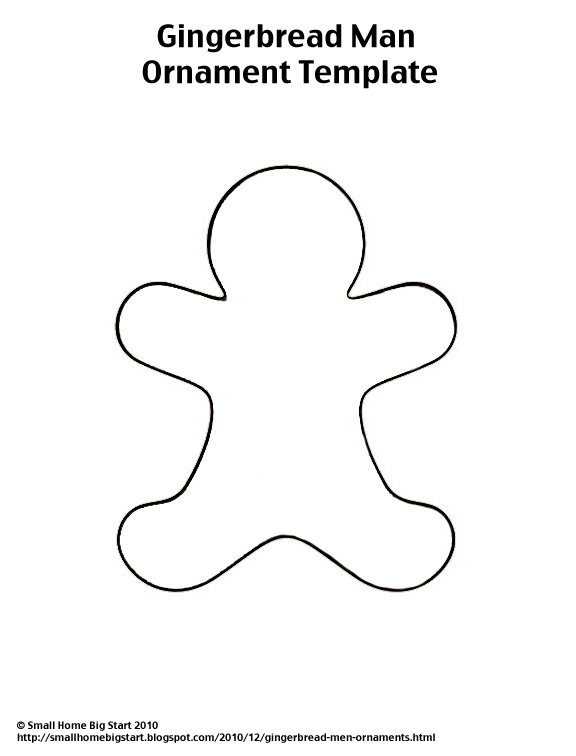 Pin a blank gingerbread man shape to the back of the button one. 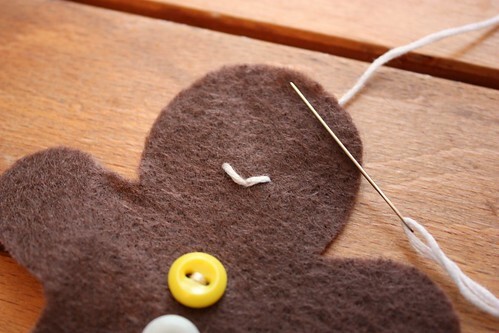 Using brown thread on a sewing machine, stitch 1/8″ in from the edge around the entire shape. Don’t worry if its not perfect because you can cover mistakes with the stitching later. If you would like to stuff it slightly to make it a little puffy, you can do so now, by leaving a 1/2″ hole in the stitches on one side. Then lightly stuff the shape and sew the hole by hand. 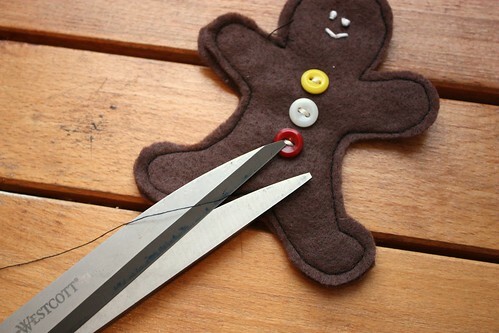 Trim any excess thread or felt that doesn’t line up. 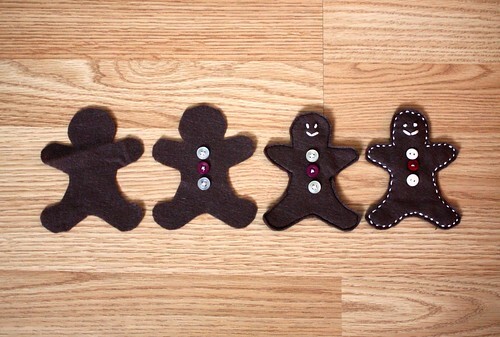 Here is a gingerbread man from start to finish. Here they are on the Christmas tree, looking fun and festive. I made 9 to go around my tree, but the great thing is that they are easy to whip up more for another year with a bigger tree. You could also use them as tags on gifts! 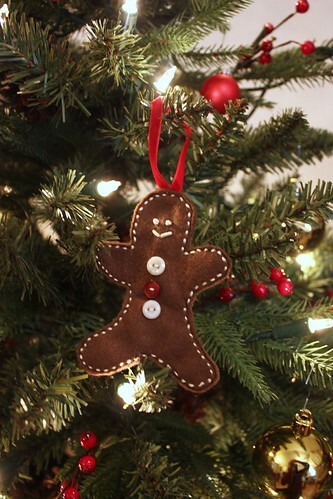 There is nothing better than the classic gingerbread man. Just adorable. I am jealous of that great stash of buttons you have. He’s so cute! 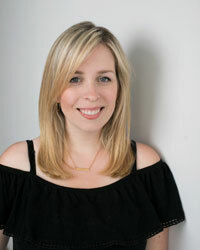 I’ve enjoyed your blog and have become one of your newest followers. Thanks for your visit and leaving such a sweet comment. Welcome to the party! The little men are adorable! Excellent job! Cute! The white stitching around the whole thing really gives it charm! I love it! Adorable! I love it! I’ve been thinking about trying one with an old sweater, but still trying to figure out how to make it! Thanks for the tute! They’re too cute! 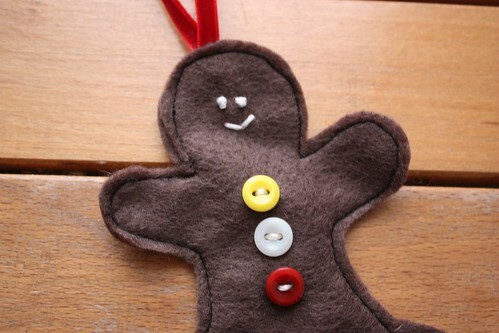 They are definitely cute, who doesn’t love gingerbread! 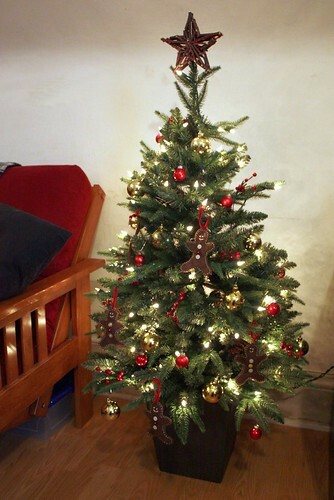 Perfect for a country christmas tree too! Thanks so much for linking up to Make the Scene Monday!